Bulk grain storage bunkers from Grainmaster Bulk Storage Systems are often used to replace traditional storage products such as grain silos as they provide a more cost effective and efficient solution to grain storage. Grainmaster offer to assist customers with all aspects of design and construction including the earthworks. A proven barrier to storm and pest threats. Grain can be loaded in and out of a Grainmaster storage bunker quickly and efficiently while making use of common farming equipment. 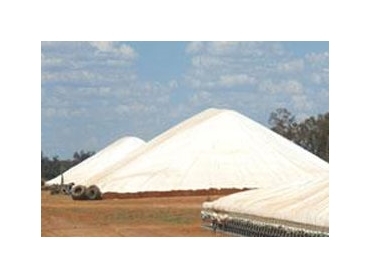 When compared with dirt walled storage bunkers Grainmasters bunkers have tarpaulin with a high quality seal that remains secure enough to eliminate grain loss, moisture exposure and effective fumigation. The unique design of the Grainmaster grain bunkers also mean that they are fully portable and can be built upon any soil type and are completely portable.